Labrada Fat Burner Powder 90g. This synergistic formula provides Green Tea and Caffeine, which together increase the release of the most effective fat burning hormone norephinephrine, while also increasing 24-hour energy expenditure, to have you burning calories while even at rest. A clinically proven fat burningingredient, ForsLean derived from Coleus forskohlii, has a direct effect onAdenylate Cyclase the enzyme that activates cyclic AMP or cAMP, supporting the breakdown of stored fat, increased utilization of fat as fuel, and an increase in thermogenesis and metabolic rate. It has also been suggested to have an effect on hunger, reducing calorie in-take and helping maintain lean body mass while dieting. Contains the active ingredient chlorogenic acid, which has been shown to promote weight loss by reducing the absorption of glucose, but also inhibiting the accumulation of fat in the body through fat metabolism in the liver. Caffeine’s is a multi-faceted fat burning ingredient that works to crank up energy, increase metabolic rate, suppress fat absorption, increase mobilization of fat and enhance the fat burning process. It has a synergistic effect with Green Tea and Green Coffee, increasing their effectiveness by blocking the degradation of the enzyme that breaks down cAMP, allowing for prolonged fat burning activity. Isolated from red raspberries, Raspberry Ketone works to activate the hormone sensitive lipase enzyme which may help support lipolysis or fat breakdown! This ketone also has a direct effect on metabolic rate, increasing norepinephrine! Contains the active component EGCG (epigallocatechin gallate), which increases thermogenesis or energy expenditure. EGCG supports the amount of fat used as energy during exercise and post-workout by inhibiting the re-uptake of the fat burning hormone norepinephrine, which is a key compound involved in metabolic regulation and appetite control. This non-stimulating compound is necessary for unlocking long-chain fats from stored fat cells to be burned off as energy. Essentially, without L-Carnitine Tartrate body fat remains locked up and inaccessible to fat burning! L-Carnitine Tartrate dials up lipolysis or fat burning, while at the same time preserving lean, hard muscle tissue, by switching off protein catabolism and carbohydrate utilization. Cayenne pepper increases norepiniephrine release, the key fat burning hormone via the active ingredient capsaicin. Cayenne pepper can also help support appetite control. 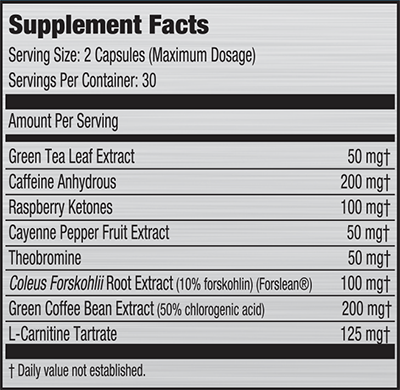 Provides a source of methylxanthines that act similar to caffeine in the body, delivering long-lasting feel goodenergy! Theobromine can also reduce appetite. Directions: To assess tolerance begin by taking 1 capsule 30-45 minutes before morning and mid-afternoon meals. Once tolerance is established take 2 capsules one to two times daily. Do not take within 6 hours ot bedtime. Note: This product is not suitable for people with high blood pressure, heart problems and pregnant women. If you suffer from any chronic illness, consult a doctor before use. Nutrex Lipo-6 Black Hers Ultra Concentrate 60 capsules coming soоn !!! Nutrex Lipo-6 Black Hers 120 capsules coming soon !!! Maximum Toning Cream coming soon !!! Nutrex Lipo-6 Black 120 capsules coming soon !! !